Home » Food » Tastes Like…? 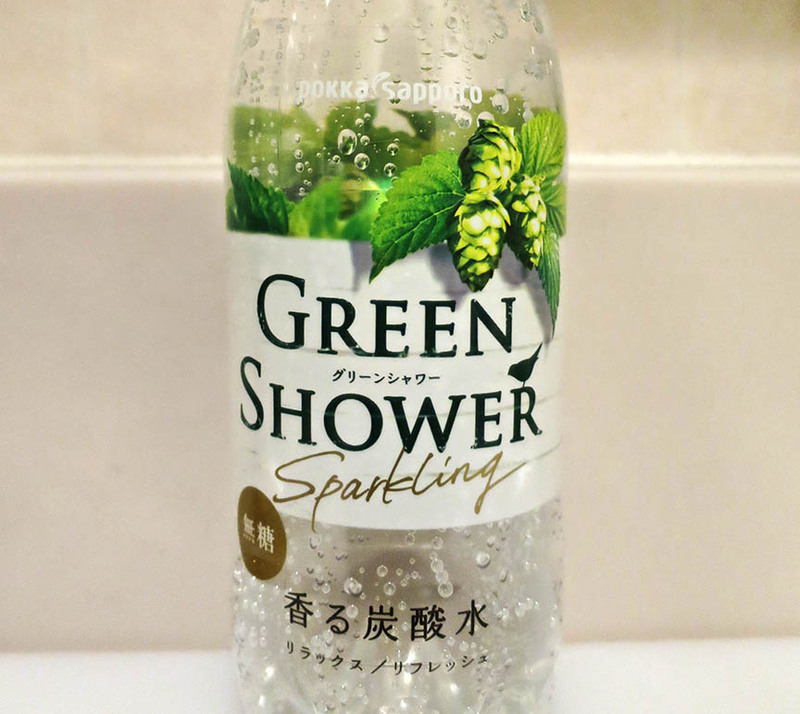 Green Shower Sparkling Water! Let’s see, this will taste like…what ARE those artfully clustered things at the top of the label? At first I thought PINECONES. I check what might be the Japanese description below. The kanji reads, “fragrant charcoal sour water.” Oops, my bad, charcoal + sour = carbonated, who knew. This does not help me know what to expect when I pour myself a tall one. Okay, when in doubt, read the fine print on the back. Aha, they’re hops. Yes, the kind they make beer from. Beer flavored water! I uncap it and take a sniff. Huh. Pine-y. Take a swig. Pine-y and mint-y. Green Shower, I don’t really know what I expected, but I am disappoint. I’ll just HOP in the shower…. Its a Hop Flavored Seltzer water, and its actually really good. Made by Sapporo. Had it in Akita Japan this past summer. You’re the first person I’ve met who’s tried it (besides me, and that doesn’t count!) Did you know what taste to expect when you took that first sip? I kept thinking that if I was more of a beer maven, I’d be able to taste the similarities, but alas, I couldn’t quite make the connection. I just remember the flavor was refreshing – if unfamiliar – on a hot summer day! My wife just found me a bottle and is bringing it home from Japan. I love seltzer water and love beer. This stuff is great. I recognized the Hop cones right away. And loved it from the first sip .. A hot humid day in Akita.